With another week of NFL action behind us, and another week of fresh data to analyze and consider, I’m here to help you with some of your toughest Week 6 fantasy football start/sit decisions. 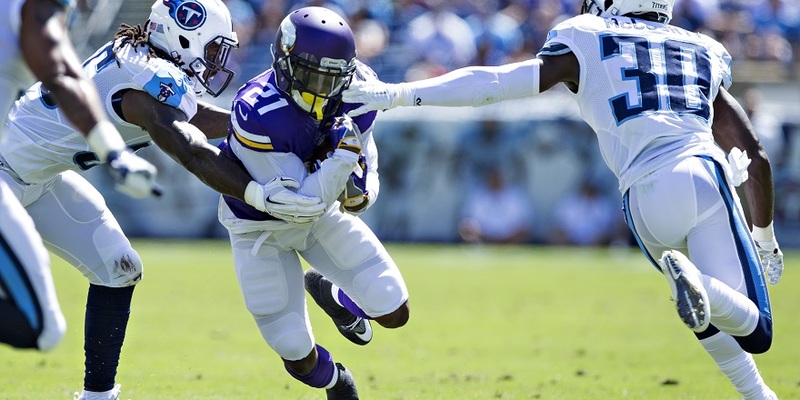 Jerick McKinnon, RB, Minnesota Vikings – Even after Monday’s big game, I’m still highly skeptical of McKinnon’s season-long prospects. We have a multi-season sample of McKinnon failing to separate himself from plodder and current free agent Matt Asiata (career 3.5 yards per carry). While I’m confident Latavius Murray isn’t far superior to Asiata, I still think McKinnon’s production will be entirely dependent on gamescript moving forward – to be used when the team wants to go pass-heavy (and is likely trailing). While last week’s game against the Bears was a close-scoring affair, the game still set up more favorably to McKinnon’s talents. By the end of the game, Chicago was without linebackers Jerrell Freeman, Nick Kwiatkoski, Danny Trevathan, John Timu, and Willie Young. These players accounted for 98 percent of Chicago’s linebacker snaps last season, leaving them more vulnerable to a player like McKinnon, who is a very dangerous receiver out of the backfield. Still, all of this being said, this week does look to again be in McKinnon’s favor, as Green Bay could turn this game into a pass-heavy shootout. I have McKinnon as a high-end RB2 this week and Murray as a mid-range RB3. Javorius Allen, RB, Baltimore Ravens – For similar reasons to why McKinnon was a strong play last week against the Bears, so is Allen against Chicago. Allen ranks 12th among running backs in targets and 13th in expected fantasy points per game. With Terrance West likely to miss time, Allen could be used in an even larger capacity this week. So far, Allen is averaging 18.7 carries per game and 4.0 targets per game in victories, and 5.0 carries per game and 6.0 targets per game in losses. Vegas suspects the Ravens win this game easily, as 6.5-point home favorites. If Vegas is right, Allen should be an equally strong play in both standard and PPR leagues. Though Alex Collins has been hyper-efficient, his usage hasn’t been enough to be too concerned. Mike Evans, WR, Tampa Bay Buccaneers – Nearly every week I’ve told you to bench the receiver most likely to be shadowed by Patrick Peterson. This week is slightly different, however, as Jameis Winston has shown throughout his career he’s going to heavily target Evans regardless of how difficult his matchup might be. Evans saw 17 targets in 2016’s meeting between these two teams. This season, he’s seen a combined 31 targets across the three games he was primarily shadowed by Xavier Rhodes, Janoris Jenkins, and Stephon Gilmore. Evans is good enough and should see enough volume to return value, despite the tough matchup. Andre Ellington, RB, Arizona Cardinals – Among all players, Ellington ranks seventh in expected PPR fantasy points and fifth in targets. The arrival of Adrian Peterson likely means the league’s most pass-heavy offense (passing on 71 percent of plays) runs more this week, but Ellington shouldn’t take too much of a hit. Going run-heavy against Tampa Bay appears somewhat foolish considering they rank fourth-best in yards per carry allowed, but ninth-worst in opposing passer rating. Pace should be high in this contest as well, and with shoot-out potential, considering Tampa Bay is fairly pass-heavy in their own right (65 percent, fifth-most). The matchup bodes especially well for Ellington, as Tampa Bay is also allowing the fifth-most receiving fantasy points per game to opposing running backs. Matthew Stafford, QB, Detroit Lions – Stafford’s name was mentioned quite frequently this week, but he’s an easy start to me. We have a long history of quarterbacks exceeding expectations when traveling to the Superdome. Stafford did suffer an ankle injury in Week 6, but has since practiced in full, and looked fine last week, completing 11 of 15 passes for 130 yards and two touchdowns in the fourth quarter. He’s a mid-range QB1 for me this week. Evan Engram, TE, New York Giants – Engram currently ranks sixth among tight ends in expected fantasy points, fifth in targets, and first in routes run. The Giants just lost wide receivers Odell Beckham Jr., Dwayne Harris, and Brandon Marshall to season-ending injuries, while Sterling Shepard is also questionable for Sunday’s game against Denver with an ankle injury. Ultimately the Giants will be without at least three of their four top wide receivers. The Broncos are allowing the sixth-most fantasy points per game to opposing tight ends, and Engram seems poised for a big game as the (literally) only healthy receiving option on this team. Will Fuller, WR, Houston Texans – Fuller has four touchdowns on six receptions through two weeks, since returning from a collarbone injury. If that seems highly unsustainable, that’s because it is. That said, Fuller is still a strong play this week with DeAndre Hopkins likely to draw shadow coverage from Jason McCourty, who currently ranks as our highest-graded cornerback in the league. Ryan Griffin is also a fine desperation play against a Cleveland defense that has allowed the second-most fantasy points per game to opposing tight ends in each of the past two seasons. Elijah McGuire, RB, New York Jets – Bilal Powell didn’t practice on Wednesday, and at the very least will be limited for Sunday’s game against the Patriots. Forte practiced on Wednesday, but if he’s out, McGuire is a strong start against the Patriots. McGuire caught 129 passes in four years of college and draws a New England defense allowing the most receiving fantasy points per game to opposing running backs. If Forte plays, however, I’d be looking for a better option. Mark Ingram, RB, New Orleans Saints – Ingram ranks 19th-best in expected fantasy points per game with 13.3, and should assume the bulk of Adrian Peterson’s now-vacant 4.2 expected fantasy points per game. Alvin Kamara (12.3 expected fantasy points per game, ranking 24th) has been the more buzzed-about name following Peterson’s departure, but I have Ingram well ahead in my rankings this week. Detroit has been more susceptible to running backs via the pass over the past two seasons, but Vegas projects New Orleans to win fairly easily (favored by 6.0 points at home). Kamara has out-targeted Ingram, but only by five (26 to 20), while Ingram leads in carries 42 to 15. DeVante Parker, WR, Miami Dolphins – Prior to last week, Parker ranked eighth among wide receivers in expected fantasy points per game, 14th in actual fantasy points per game, eighth in targets per game, and second in air yards per game. Given that kind of immense volume, if he plays this week, you’re starting him. Jay Ajayi, RB, Miami Dolphins – It’s hard to make a case for Ajayi against an Atlanta team likely to win handily, and whose defense is far more susceptible to running backs via the pass than on the ground. Though he’s unlikely to be heavily used as a receiver, or on third downs, he did see 25 carries last week. You’re likely stuck starting him and just hoping for the best. I have him as a high-end RB2 in my rankings this week, but I undoubtedly feel gross about it. Marcus Mariota, QB, Tennessee Titans – Without any rushing production last year, Mariota would have fallen from 10th to 24th among quarterbacks in fantasy points per game. While dealing with a hamstring injury, it’s unlikely we see much rushing production from Mariota, assuming he plays, but I still like his chances at a big game if he does. 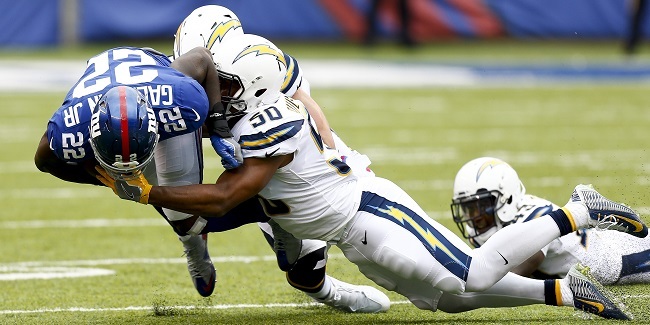 Indianapolis’ defense has historically underperformed at one of the worst rates in the league when on the road. This season, they’ve surrendered the second-most fantasy points per game to opposing quarterbacks, including two 22-plus-fantasy-point games to Brian Hoyer and DeShone Kizer. Wayne Gallman, RB, New York Giants — Only three times since Ben McAdoo became head coach have the Giants had a running back score at least 15 PPR fantasy points in a game. Gallman led the team in carries last week with 11, but still saw just 38 percent of the snaps. He’s an easy fade in a game the Giants are likely to get smashed. Carlos Hyde, RB, San Francisco 49ers – Hyde has served a highly valuable role over the past five weeks, but is PFF’s worst-graded running back, and just earned a demotion from head coach Kyle Shanahan. He was out-touched by Matt Breida last week 13 to nine. As 10-point underdogs on the road against Washington, it’s unlikely either running back should earn a start. Sammy Watkins, WR, Los Angeles Rams – Watkins has a bit of a “squeaky wheel” narrative working in his favor, but also draws a brutal matchup against the Jacksonville Jaguars. This season, outside cornerbacks Jalen Ramsey and A.J. Bouye are allowing a combined 30.72 passer rating into their coverage. For perspective, spiking the ball into the dirt results in a passer rating of 39.58. Watkins also ranks fourth on his team in targets, and 67th among all wide receivers. He’s an easy fade this week. Amari Cooper, WR, Oakland Raiders – Cooper has seen 20 targets over the past four weeks, somehow totaling only 57 yards. Cooper gets Derek Carr back this week, but is also likely to be shadowed by top cornerback Casey Hayward. In Week 15 of last season (with Jason Verrett out), Hayward shadowed Cooper, holding him to just one catch for 28 yards on three targets. Derrick Henry, RB, Tennessee Titans – Henry is too risky to start this week, after a healthy DeMarco Murray seemingly regained full control over the Tennessee backfield. Last week, Henry saw just 11 snaps and four touches to Murray’s 49 snaps and 18 touches. Samaje Perine, RB, Washington Redskins – The matchup is good for Perine, with Rob Kelley likely out, but he also ranks as our second-worst-graded running back this season. He is unlikely to be used in the passing game, and averages just 3.1 yards per carry for the season. Duke Johnson, RB, Cleveland Browns – Johnson’s fantasy numbers look good over the past few weeks, but I see it as variance and unsustainable efficiency on low-volume. Johnson has scored two rushing touchdowns over the past three weeks, despite seeing just 12 total carries. While he has seen a respectable 20 targets over the past three weeks, new starting quarterback Kevin Hogan has targeted Johnson at a much lower rate (10.5 percent) than Deshone Kizer (17.7 percent) this year. Johnson is a high-end RB3 for me this week, up against a Texans defense surrendering the 12th-fewest receiving and seventh-fewest rushing fantasy points per game to opposing running backs.